The new plan will be formally implemented at next year's Cable-Tec exhibition in New Orleans, and will coincide with the SCTE-ISBE's 50th anniversary celebrations. Cable-Tec is widely acknowledged as being the largest cable telecom event in North America and offers the chance for cable professionals to share their technical expertise and explore the latest state-of-the-art technology innovations. The new 10-year plan aims to "continue to build the relevance and value of the Expo as a platform for driving learning and development, applied science and technology leadership for the next decade," said Chair of the SCTE-ISBE Board of Directors, Bill Warga. This year's exhibition featured an extensive program of activities, educational sessions and interactive workshops featuring input from the National Cable Television Cooperative, ANGA Association, Comcast, the American Cable Association, the Rural Broadband Association and more. There was also the opportunity to hear insights from some of the cable industry's leading lights. President of Cox Communications, Pat Esser, delivered a keynote speech - with Cox's EVP and chief product and technology officer, Kevin Hart, chairing the event. Digitizing the Customer Experience - providing insights into the customer-impact of service and network issues and how to improve the customer experience through more agile testing and launching services. Wireline Access Network - an exploration of the future of DOCSIS/FDX, how to future-proof fiber and node architectures, and best practice in optimizing network architectures for smart segmentation and last-mile technologies. Wireless Access Network - offering advice for capitalizing on the potential of 5G, the economics of multi-use case/multi-band 5G deployments, the practicalities of fixed wireless access for greenfield and brownfield overlay, and overcoming the challenges of 5G low-latency requirements for DOCSIS. Operational Transformation - exploring the potential impacts of machine learning and artificial intelligence on the cable industry. Video - advanced video services, emerging compression standards and the logistics of moving into an all-IP world. This year's Expo provided the platform for PPC to demonstrate a variety of broadband connectivity solutions which included: Perfect Flex®, Category Cable, Right Angle Adapters, Amplifiers, Hardline Connectors and AquaTight®. 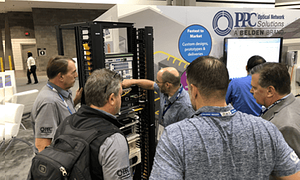 PPC's end-to-end fiber portfolio also took center-stage - including displays of headend fiber management, high-density passives, cabinets, fiber transport and optimization equipment, custom cable assemblies, and fiber demarcation enclosures. 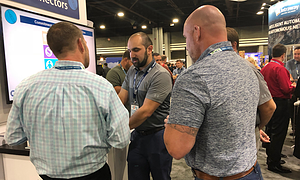 A program of live PPC product demos included Miniflex® and QuikPush® fiber solutions for last-mile FTTx deployments, Optical Line Monitoring Systems (OLMs) and optical test equipment.